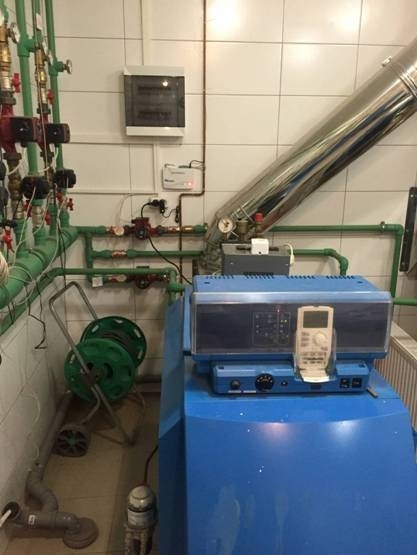 In this article, we will consider the implementation of remote control of Buderus Logano G225 gas boiler by setting up the GSM-Thermometer. To control power supply availability. 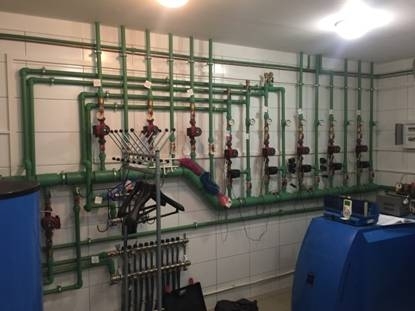 Thus, in the boiler room of the house piping manifold is made, the Buderus Logano G225 boiler is mounted with the Logamatic 4211 control system, including the ZM 422 boiler module. 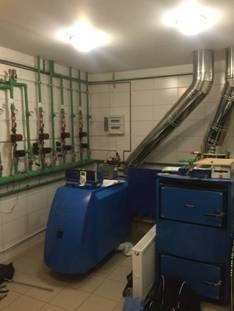 The boiler room also has an additional solid fuel boiler in order to achieve the system backup. In this regard, its automation or remote control was not required. Heating system and hot water system operate properly in automatic mode, but since there is no possibility to control the temperature in the house remotely, too much fuel is used when dwellers do not live in the house. 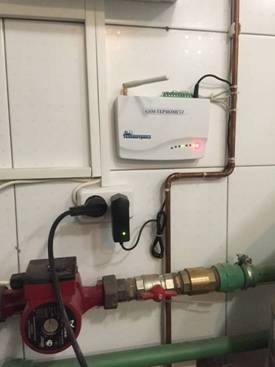 In this regard, the customer decided to install a boiler remote control system and chose the GSM-Thermometer from our company. We are choosing a place in the boiler room to install a GSM-Thermometer, mounting it on the wall and connecting to the power supply. Demounting of the cover of the boiler control system. 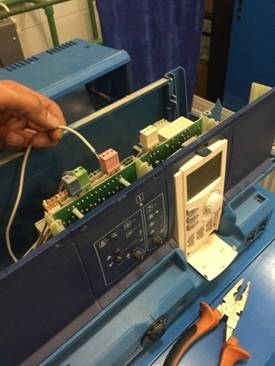 After demounting the cover of the control panel, we connect normally closed contacts of the relay output of the GSM-Thermometer to the WF1-3 terminals of the ZM 442 module (terminals 6 and 7). Then on the Buderus MEC2 control unit in the settings of the heating circuit in the service level, adjust the circuit like a circuit of constant heating temperature (say 65°C). In night mode settings set "disabled". In the service menu, set the WF contact working mode as 1-3, that is, turn on the outer query of the switch to the day mode. By using this scheme, leads from the ZM 442 module connection terminals are connected to the normally closed contact of the device relay, i.e., when power of the GSM-thermometer is off or when it is faulty, the relay contact is closed and the boiler (heating circuit and DHW circuit) works at the temperature set at ZM 442. In normal operation, the module circuit will be switched on and off on command from the GSM-Thermometer. 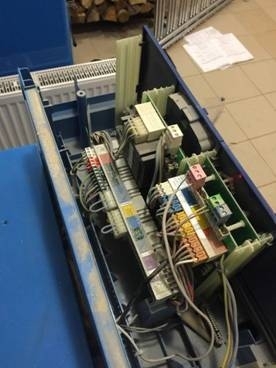 It should be noted that in this case a heating circuit and DHW circuit are controlled by one ZM 442 module, and when the heating is off, water heating is also off in the hot water supply system. Considering that the Logamatic 4211 control system is modular, an additional module FM442, which is responsible only for the DHW circuit, can be added to it. In this case, ZM 442 (and the GSM-thermometer connected to it) will control only heating circuit. That means that the hot water will be prepared all the time. In the existing configuration of the system for remote control of heating and DHW circuit, the connection of the circulation pump of the heating circuit via the relay contact of the GSM-Thermometer was possible. However, in this case, there was no such objective, because the goal was to transfer the entire system into a low-power working mode for the period when dwellers are absent in the house and restore normal mode before the dwellers arrive. Thus, our assembly is completed and the system is ready to be configured. Next, set up the GSM-thermometer based on the required logic. In this case, when the dwellers are absent in the house on working days, set in the thermal control settings of the GSM-Thermometer + 7 ° C, before the holidays begin, when it is planned to visit the house, thermal control setting will change by the command from user’s phone using iOS or Android APP form Telemetrica to + 23 ° C.